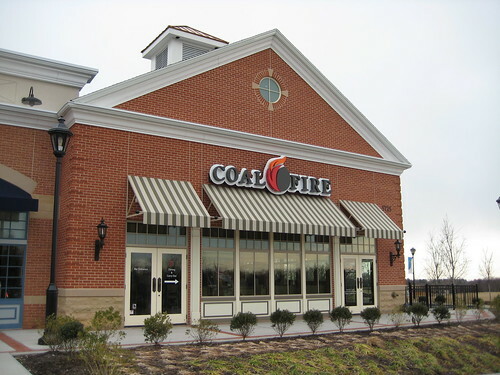 I finally made it out to Coal Fire this week, a pizzeria where “charred to perfection” is their motto. Sure enough, they live up to it; their coal-fired oven produces a very thin crust with a crisp bottom and a charred top. It’s enjoyable but I didn’t notice any change in flavor. Should I have? What I did notice was that the crust lacked the baked flour particles on the bottom, yet it wasn’t greasy at all. Nifty. Their menu is a mixture of pizza, salads, pasta, subs, wings, and a handful of appetizers. No desert on the menu, but Cold Stone Creamery is just across the parking lot. Briefly, some non-pizza items. Just in case someone in your party doesn’t like pizza. The Hand Cut Fries ($3.95) are thin and stringy with a nice texture, served up in wax paper atop a decorative metal thingy. They don’t taste frozen. I usually wouldn’t order potatoes as an appetizer to pizza, but there were a few baskets already ordered to be shared around the table. 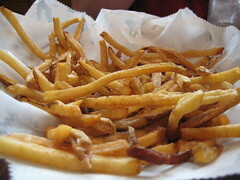 If you order the fries, eat ‘em up quickly; they’re excellent hot, good warm, but not so great cold. 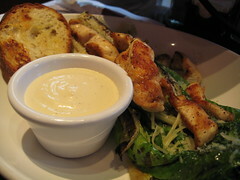 The Grilled Caesar Salad ($7.95), where they stick the entire stalk of Romaine in the oven. Interesting concept and reportedly tasty, but the portion size looked a tad small for the price (plus another $4 for chicken, $5 for shrimp). The side salad that came with the Creole Pasta ($14.95) — which reportedly had a nice zesty bite to it — was larger. But seriously, on to the pizza. You pick your size, sauce, and toppings. If you’re hungry, a 12″ ($10.95) will feed one person. If you’re hungry, a 16″ will easily feed two for $3 more. They have three sauces: one traditional Italian with plum tomato taste, one spicy “that commands your complete attention,” and their signature mixture of the first two. Toppings are fairly scant, compared to most places. Bacon and chicken are notably absent, despite their presence in other dishes on the menu. There are three suggested pizzas on the menu, each featuring a different sauce and combination of toppings. Each is made with fresh mozzarella, which is apparent in that has a more mellow taste and melts unevenly then the typical shredded refrigerated kind. You’ll end up with a blob or two worth of melted cheese per slice instead of a more uniform distribution. We shared one of each of the suggested 16″ pies. 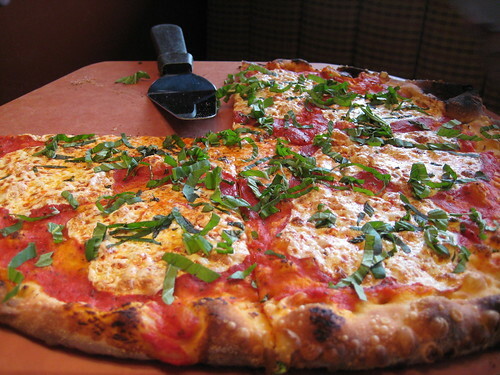 Margherita ($14.95) – Dough brushed with olive oil. Classic Sauce. Chopped basil. I found this to be rather bare. Despite not having much else on it to compete, the sauce didn’t strike me as being all that flavorful. The cheese melting as thin as it does, a pizza needs more than just basil. 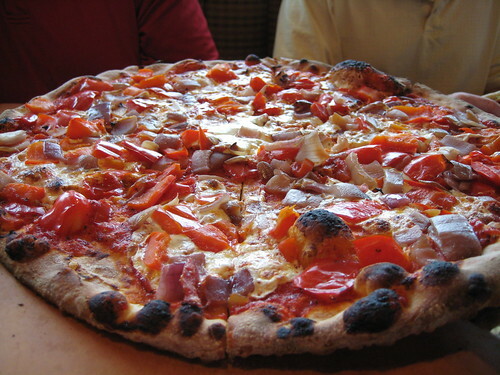 Rustic Red – ($17.95) – A mixture of fresh roasted red peppers and red onions, with the signature sauce. This one was sweet and flavorful with lots of toppings. The roasted vegetables really brought out the flavors, while providing a juiciness that was lacking in the previous pie. There was a hint of a kick to the sauce, but nothing too spicy for kids or spice-averse folks. Definitely my favorite of the three. Ring of Fire ($17.95) – The spicy sauce, with banana peppers and Italian sausage. Toppings were sparse. I think most of the spice came from the banana peppers than from the sauce, but it left me with a bit of fire on my tongue and a tiny bit of sweat on my brow. Spice note, noted. It’s a nice looking place from the outside, all done up in brick. New, just outside a new community of upscale townhouses and McMansion homes. There’s a decently sized patio on the right-hand side of the storefront, which would make a nice place to have lunch once the weather cooperates. Inside, it’s a mixture of tables, booths, and wall-mount bench seating. Modern aesthetic and very clean. Pop/alt rock music was playing the whole time, a mix of Coldplay, Oasis, Dave Matthews, and Maroon 5 was noted. Nothing too loud or obnoxious to drown out your conversation, but enough so that you don’t have to hear the folks in the next section. Service was friendly and prompt. I liked Coal Fire, but probably wouldn’t make a special trip. If I were in the area, I might stop in for lunch. Or maybe to meet people for Happy hour; Monday through Friday from 3-6pm, half-priced 12″ pizzas at the bar area. Otherwise, you’re paying a premium for thin crust from the place’s namesake.